The numbers of individuals diagnosed with diabetes continue to climb, with nationwide levels reaching record high levels. 35% of Adults (aged 20 years and up) have pre-diabetes. 50% of Adults (aged 65+) are pre-diabetic. Alabama, Mississippi, and West Virginia have the highest levels of diabetes in the country, as the Southern states continue to have the highest levels of obesity and diabetes. 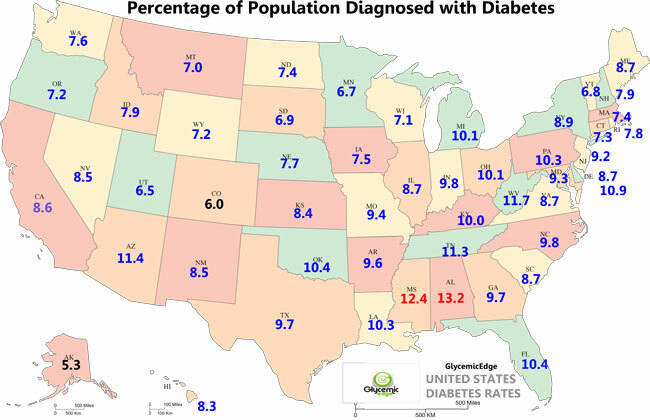 Alabama led the nation with a high 13.2% rate of the population having been diagnosed with diabetes (does not include pre-diabetes or borderline diabetes diagnosis, see blood sugar chart). Nationwide average of 8.7% also reflected the leaders, as Alaska and Colorado had the lowest levels of diabetes at 6.0% and 5.3% respectively. Colorado also led the nation with the lowest levels of obesity, a strong correlation along with lifestyle and dietary choices (see glycemic index food lists).